School is in the air....the smell of new backpacks, lunch boxes, fresh crayons, erasers, markers - it's everywhere! And honestly, I'm not too thrilled about it. I mean, part of me is. The kids are looking forward to seeing friends again. Sarah is very excited about being in first grade. I'm GLAD they feel that way. However, this morning as I was thinking about it (for the gazillionth time), I realize I am really going to miss them not being around. Even my little headstrong one (haha). We have been so busy this summer, but for the most part we have been busy TOGETHER. Now, a different kind of busy is going to set in. Instead of us doing things as a pack, it will be a matter of each one doing his/her own different thing (which I do encourage - don't get me wrong), and Charles and I will become the overseers/shauffers/cheerleaders of these things. It's time to clean off the dry erase board and start filling it up with daily routines and schedules. 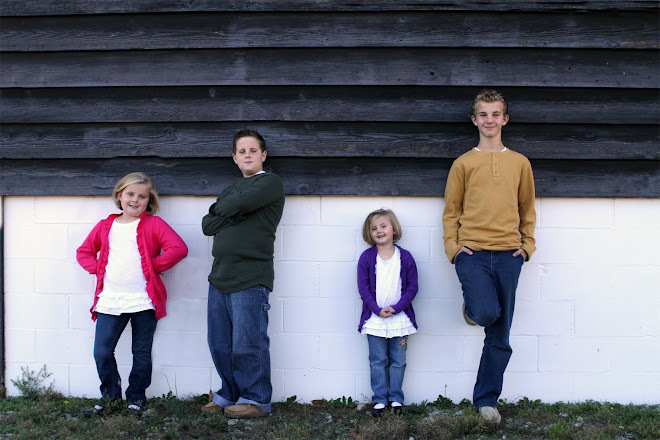 Having four kids with (for the most part) different interests makes for a busy schedule. That is okay though. If someone has an interest in something and is willing to fully commit to it, then we will do our best to make sure they can participate. Soccer season is about to start, and I am VERY excited about that! I love watching them play! This year, three kiddos will be playing. That potentially means three different teams and practices AND games (GULP!) I still have not decided if I want to request for Sarah and Ava to be on the same team. Sarah will try to helpful, but she tends to dominate. Ava needs a chance to spread her wings without Sarah trying to take over. It would be convenient (for me that is) for them to be on the same team - but I don't think it would be good for them - well Ava that is. I guess I just convinced myself didn't I? Haha! Alright then...time to stop whining about the impending doom fast approaching school year. Summer 2012 was a great season for us, but now it is time to move ahead. It is kind of like half time in a football game. We stopped, took time to huddle together and refresh ourselves, now it is time to get back in the game. (However I'm secretly looking forward to the next "time out"!) Whoop Whoop!!!! Lots of boogie boarding...the kids are quite good! Sarah doesn't have to know that she and Zachary were probably stung by jellyfish...they are such troopers! Food always tastes better at the beach. Even a peanut butter sandwich was amazing! Ice cold Diet Sunkist...Pringles...ice cream sandwiches (not necessarily together)...yum! Banana boat riding and parasailing. Josh convincing Charles to take a bite of his what appeared to be green apple or lime snowcone when in actuality it was dill pickle. Yes - it was quite funny! Only once did one child almost get left at a gas station...he still doesn't know that happened. No child wore swimmies this year...yay! And the BEST part? This year we did NOT get locked out of the condo!! Goodness! It has been so long that when I logged into Blogger, I didn't recognize all the "new" stuff! It has changed drastically. I know I need to update pics...they are a year old...but that will come later. So, what has everyone been up to the past six months? I have missed my on-line "journaling". Great therapy, but I got tired of only writing about (or FEELING like I was writing about) my strong dislike of shopping and the war between Kroger and Wal-Mart. There is only so much of that one can take. Also, I am NEVER on the computer at home. Thanks to the iPhone, it really isn't necessary - however, blogging from a phone is so not appealing. That being said, I have decided that I need to get back into this. If anything, for my kids sake. This is something for them to be able to look back on in years to come. It is all about them (well, mostly). They can read about the funny stuff, the serious stuff and things they will likely forget or maybe even never knew about. I regret not blogging about the great Disney trip of Christmas 2011. I did make notes on my phone, but no official blog. :( We did take a gazillion pics tho. I think it is a memory that will live forever in spite of my lack of writing about it! So let's just fast forward to June 2012. Sarah and Ava both had birthdays this month. They are now 6 and 5 respectively. WOW! Time has flown so quickly (as any good mother would say!) Really it has. They aren't toddlers...they are little people! Their little personalities are unfolding more each day. I think I now have a little Zachary and a little Josh on my hands,,,how I love my kids! This is the thing that has been weighing heavily on my mind lately. On the day of their party, I had been reading the blogs of two very sick kids (Trey Erwin and Lucy Krull - click on their names and go their respective blogs if you aren't familiar with their stories), and on this particular day, neither Lucy or Trey were doing well at all. It weighed heavily on my heart because I just could not fathom what these parents must be going thru. I looked at my own kids and thought about the party we had just come from and was so thankful for all the giggles and fun that had been had that day. I thought, "I am so blessed." Then just as quickly as I thought it, a small voice inside asked, "And they're not?" Right up there with "I Love You", I think "Thank You Jesus" are three of the most important. Lately, my perspective has changed - in some areas at least. I grumble when the weekend approaches because unlike "normal" people, there is no such thing as a "relaxing" weekend at our house. My husband has go to bed early Friday night because he as to be up early. Friday nights (for the most part) and Saturday mornings are a wash because he works for his dad Saturday mornings. I hate it. We have been married (almost) 15 years and I have always hated it. There has never been such a thing as curling up with the kiddos and watching cartoons, or going out for breakfast, or getting a jump on yard work, or even just being lazy. He is gone before sun up and doesn't get back until lunch. He breaks his neck to catch the end of a soccer game if it is a late one. It stinks. There are days I feel like if Ava or Sarah yell "Mom!!!" one more time, my head is going to explode! Once they bound through the door, (and I am not exaggerating) I am unable complete a single thought in my head the rest of the day. Ava is forever testing her boundaries. Thank you Jesus that (at least for today) my kids are healthy and can speak to me and call my name. So many children are sick and in the hospital for various diseases who cannot speak, or communicate with the parents who love them and would trade the world to take their place. So many others long to have a child and are unable to conceive. There are parents whose hearts are literally broken because their child was taken unexpectedly....much too early. You have given me four and I love them more than words could ever express. They are the light of my life and I am in awe that you have given them to me. I get frustrated when I miss things because of my work schedule. I always feel like I let my kids down if I can't drive for every field trip, or be at every class party. Sometimes I can switch things around, but I'm not always so lucky. Granted, there aren't many things I miss, but still... I hate hearing the disappointment in the girls voices when they ask, "Mommy, will you be home before we go to bed?" and I have tell them "no". Thank you Jesus that I have a job that I (for the most part) enjoy. So many people are struggling to find work these days. Thank you for this provision. Help me to be content where I know you have led me, and use me to minister to others. Thank you Jesus for my health. I know many who are battling cancer and would give anything just to be able to have a "bad hair day". Thank you Jesus for house full of love, noise and laughter. There are so many "signs of life" here. My goal is not to impress anyone, but to make everyone who enters to feel welcomed. Spills and spots are so trivial in the grand scheme of things! Lord, I know my life circumstances could change in the blink of an eye, but just for today - for this moment - I thank you for all the little things that tend to drive me crazy. In the end, they really are just trivial things that I (ashamedly) take for granted. I don't deserve any of this. Thank you for blessing me beyond measure...my cup truly overflows. It's been a whole two weeks (and then some) since my last post...so let's do a quick catch up ~ shall we? Soccer started for Josh and Sarah. I love watching them! Ava started ballet. My little "delicate flower" loooves Carrie Jean! Zachary is in full swing with cross country. I am so proud of his determination and dedication! Each week his times and placement get better! Josh auditioned for the school play - still waiting to hear about that. My first "Mom's In Touch" (for Crosswind) meeting is tomorrow...I'm excited! Lots of "friends" time...and more to come next week. Lunch date with hubby last week. Loved it! Nothing like uninterrupted time together...so refreshing! Frustrated with certain aspects of life...but trying to learn to be content with where I am right now. I am also developing a love for tennis shoes - particularly running shoes. The flashier the better! I have decided Ava needs a personal assistant for our morning routine. If she is left alone for a split second she is off playing in her room, or with Bernie, etc. She is on her own schedule and just moves along as she deems necessary. "Hurry up" is NOT in her vocabulary. Neither is "WE HAVE GOT TO GO!!!" My garage is hideous....must get rid of LOTS OF STUFF!! The best has been my own little family. I love my family...really I do. They gave me the best cards,and Josh even gave me cash for a present! It was HIS cash too - not like he went to his dad and "borrowed" it. If you know Josh, that is HUGE!!! He hand-made his card...wrote a poem and took up all four sides of the paper! It was really funny...I'm going to scan it and keep it...maybe even find a way to frame it. He made videos of everyone (individually and as a group) singing "Happy Birthday" to me. They ALL went out of their way to make me feel so very special ~ and it worked! "Christ will make His home in your hearts as you trust in Him. Your roots will grow down into God's love and keep you strong. And may you have the power to understand, as all God's people should, how wide, how long, how high, and how deep His love is. May you experience the love of Christ, though it is too great to understand fully." I am fortunate to have been married to my best friend for 15 years. God has blessed us with four beautiful children who's mission in life is to keep us on our toes! I love the people they are becoming and am so honored to be a part of it! Chaos (it seems) is our constant companion, but that is okay...our house is fun, noisy and never dull! One more.....because I just love this pic!